Can use RSI or Bollinger bands as a trend filter for pin bar, morning/evening star and engulfing formations in order to properly identify potential reversals. 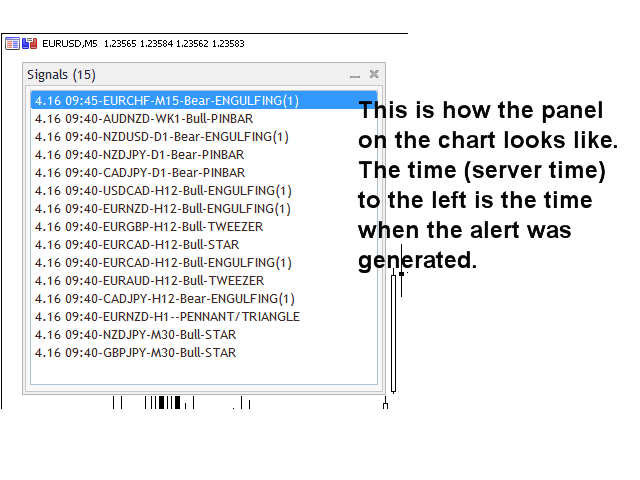 You can place the indicator on for instance EURUSD M5 chart and receive an alert from any symbol and any timeframe of your choice. Trend filter to use: This is a drop down menu where you can select from RSI or Bollinger bands. 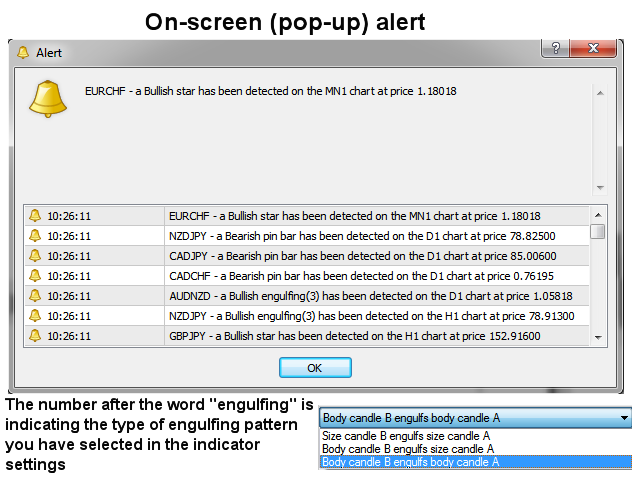 Minimum candle body size % (0 = any body size): The scanner will filter out Dojis by default. Recommended setting is 0. But if you would like a larger body, you can set a higher value. Minimum percent for tail: Default is 50. If you would like a larger tail you can set it to for instance 70. It will give fewer signals but higher quality. Use pinbar RSI: 'true' or 'false'. Enabled ('true') will get fewer signals but higher quality. Include tweezer scanning (Engulfing must be enabled): 'true' or 'false'. Min. engulfing candle body size % (0 = any body size): A higher percentage (larger body) will give higher quality signals. Min. engulfing candle size in points (0 = any size): Only Engulfing candles (second candle) larger or equal than this size will give an alert. Default is 0. Max. engulfing candle size in points (0 = any size): Only Engulfing candles (second candle) smaller or equal than this size will give an alert. Default is 0. Use engulfing RSI: 'true' or 'false'. Enabled ('true') will get fewer signals but higher quality. Engulfing RSI shift: Candle (shift) on which to calculate RSI. 1 = engulfing candle, 2 = candle prior to the engulfing candle. You can also set this to a higher value. Default is 2. Use morning/evening star RSI (on second candle in formation): 'true' or 'false'. RSI overbought and oversold levels: Pin bar/Engulfing must form above/below these levels in order to be valid. Bollinger shift and deviation: Default is 0 and 2. RSI/Bollinger Period: Typically 10 for RSI and 20 for Bollinger. RSI/Bollinger apply to price: The level is calculated from this setting. Time frames: Set to 'true' for each timeframe you would like to monitor. I've just rented this for a month and initial impressions are good. Its quite likely I may go on to purchase as scanning all assests on all time frames is not practicle. It will be used to support existing strategies. The only reason its not 5 star is having the candle/s highlighted on the chart would be nice, but I accept its not possible.